the global tuna market is anticipated to face a steady growth in coming years due to various vendors in the market trying to come up with better products. According to a report by Transparency Market Research, the market’s competitive landscape is currently fragmented because vendors are engaging in stiff competition. The vendors are competing on the basis of brand, distribution, price, and quality. The vendors are catering regional market according to the region’s taste and preferences. Along with their socioeconomic and economic conditions. 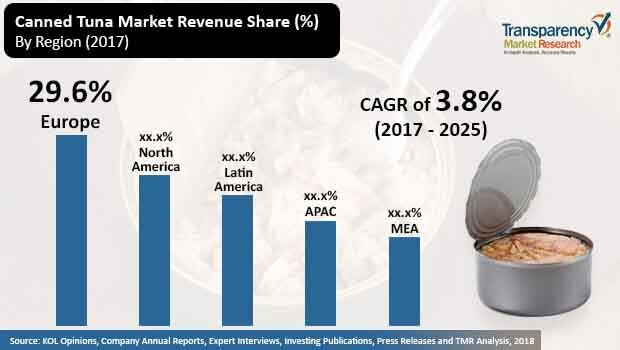 New experiments and innovations in taste and flavour is likely to boost the market and show significant rise in the global canned tuna market. Some of the leading companies in the market are Alliance Select Foods International, Inc., Princes Group, American Tuna Inc., Ocean Brands GP, and Aneka Tuna Indonesia.